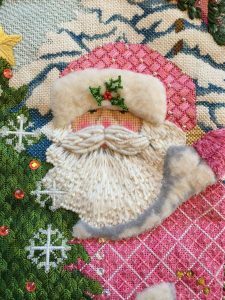 Welcome to the Wellesley Needlepoint Collection’s Cyber Workshop Page. Our staff is excited to help you improve your needlepoint by learning some new techniques in the comfort of your own home at your own pace. We currently offer three cyber workshops but plan to add more in time. 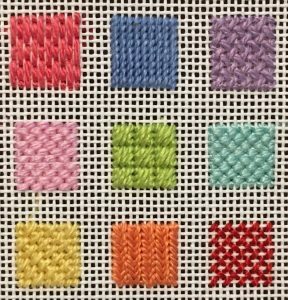 Upon purchasing the class, we will send you a package with all the supplies you need to complete the class – canvas, needles, threads, stretcher bars and complete instructions. In that packet will be instructions and a password to enter the workshop with the button below. You will receive everything you need to succeed with beading – beads,sequins, needles, a bead mat to keep them in place, tweezers, threads and a canvas on stretcher bars to practice with. In that packet will be the handout with detailed diagrams and instruction and the access information to the video that you may view for as long as you like at your own pace. 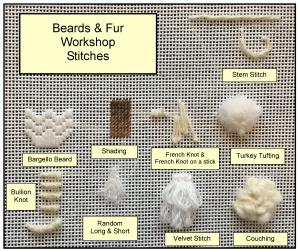 In this cyber workshop you will learn many of the stitches we use to create glorious beards, hair and fur. 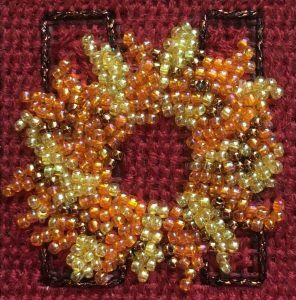 In the comfort of your home at the pace that works best for you, you will learn how to use the shading technique, how to create french knots, french knots on a stick, turkey tufting, couching, random long and short, velvet stitch, the outline stitch and finally the bullion knot! We kindly ask you to respect our business and not share the password. We will be changing the password periodically for this reason. If your password expires before you finish your work, please just email us and we will give you the current password. Thank you for understanding.